White River Hope was sold at the All About Art show and sale that was held in Elkins Park, PA. 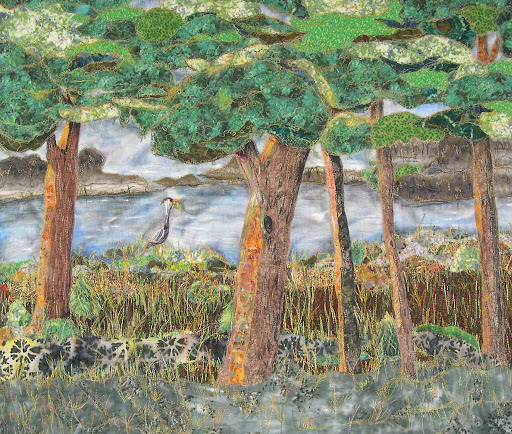 This art quilt had been juried into the Denver National show, the Wisconsin Expo and was shown in a local show. It had already been a money winner with a first place and the most original quilt at the local show. It also was in Machine Quilting Unlimited as a noteworthy quilt after appearing at the Denver National. Before sending this quilt off to the sale I put a new label on the back that listed where the quilt had been shown and documented its winnings. I did this by painting on a white label and wrote the information in India Ink. My signature is buried somewhere in the stitching on the front. The quilt is composed of collaged fabrics with heavy thread sketching for the quilting. 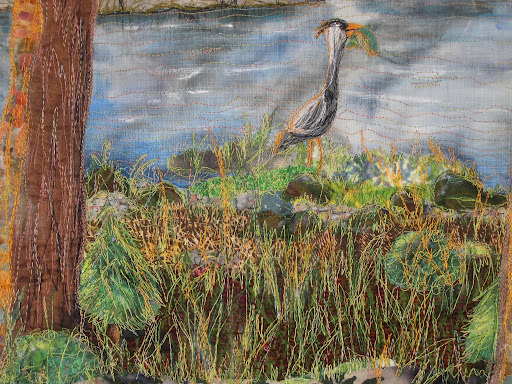 The great blue heron and the trout in his mouth are hand guided machine embroidered. I am pleased as punch! Many years ago when I did traditional quilting, and before becoming disabled, I sold some quilts. This was my first big sale for an art quilt. I hope this won’t be the last! congratulations, Janice! It's a beautiful piece with so much detail! I'm sure it will have a place in the new owners home and they'll see something different in it each time!! It won't be your last sale either for an art quilt! It's a really lovely quilt, and it deserves all the accolades and honors! The new owners will enjoy every bit of the beauty you captured.